Do you currently run your own fleet ? Do you suffer when drivers are sick, on leave or have vehicles off the road? Do you wish to add more drivers but don't want the fixed cost commitment? Our Exclusive Hourly Hire service is an alternative solution to running your own delivery fleet. We can provide the driver and vehicle of your choice (motorbike, car, van or truck). All our drivers are AACA accredited and fully trained professionals. 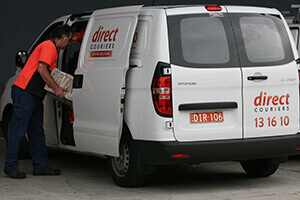 You can use Direct Couriers on an ad-hoc basis to replace a sick driver or you can use us on a permanent run to become familiar with your customers particular needs. Whatever your particular needs require, we can provide a driver dedicated to you, so let us take your worry away. You no longer need to be concerned about wages, superannuation, vehicle costs, or time off the road due to holiday or sickness, as the driver and vehicle are employed with us, you can relax as we have it covered. Along with the driver and vehicle, you also have access to our live GPS tracking system, delivery allocation system and direct messaging to the drivers PDA. To find out more about our Exclusive Hourly Hire service click here.